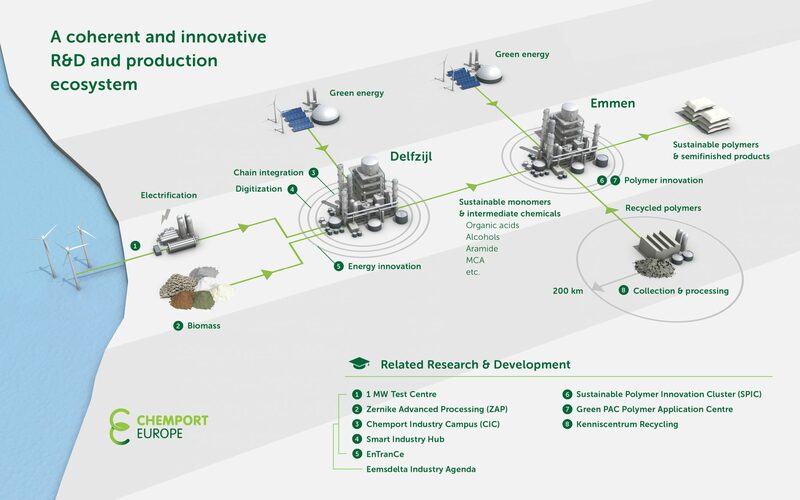 For 2030 in a competitive manner, large-scale and CO2-free hydrogen production for industrial use, that is the mission of the ISPT Hydrogen Consortium. In a new center, the Hydrohub, researchers set to work on testing and developing a hydrogen production unit on an industrial scale. This initiative, financed by the business community and the Top Sector Energy, is made possible by a strong support of 1 million from the Province of Groningen. In the Netherlands, the industry produces around 800,000 tons of hydrogen annually, releasing more than 7 million tons of CO2 emissions. This is now done by converting natural gas into hydrogen at high temperatures. By switching to electric production of hydrogen, the industry will kill two birds with one stone: both the use of natural gas and CO2 emissions will decrease considerably. In order to be able to apply this technology competitively and on a large scale, electrolysis installations are needed that can convert large amounts of water into hydrogen and oxygen on a large scale using sustainably generated electricity. The increase in scale in green hydrogen production, as indicated by the broadly supported Hydrogen Coalition, is of great importance for the energy transition. The current available electrolysis installations with a capacity of a few megawatts are far too small to realize this increase in scale. In order to switch completely to sustainable hydrogen, the industry needs electrolysis installations with a total capacity of several gigawatts. These installations must be cheaper to purchase and smarter in design than the current installations and also reliable and low maintenance. The Hydrohub is an open test center, where the partners of the consortium, but also other knowledge institutions and companies, can test innovations from their own lab in electrolysis installations of half a megawatt. When tested on that scale, it becomes clear whether new problems arise and how the technology will behave when scaling up. Once the hydrogen technology in the Hydrohub works properly, it can immediately be converted to an electrolysis plant on an industrial gigawatt scale. The research in the Hydrohub will lead to a standard for the design of large-scale electrolysis processes. Hence the international interest in this project. The ISPT Hydrogen Consortium is also going to investigate the infrastructure for hydrogen and the role of hydrogen in the energy chains of the future. Case studies will look at the introduction of sustainable hydrogen in industrial regions, such as Rotterdam, Delfzijl, Amsterdam, Geleen-Sittard (Chemelot) and Zeeland. Hydrogen technology is an essential link in the transition from industry to sustainable circular production, in which fossil raw materials and energy carriers will give way to sustainably produced raw materials and energy carriers. The partners who work together on and in the Hydrohub: Groningen Seaports, Provincie Groningen, Frames, University of Groningen, Yara, Economic Board Groningen, Hanzehogeschool Groningen, ISPT, Shell, Nouryon, Gasunie, ECN | TNO en Chemport Europe.